Hello everyone that reads my blog, I'm sorry once again for the lapse, I will get this blog thing figured out! It's just been so much easier to tweet on twitter from my phone and to use instagram for pictures...But I will get this figured out and get a rhythm to my blogging. 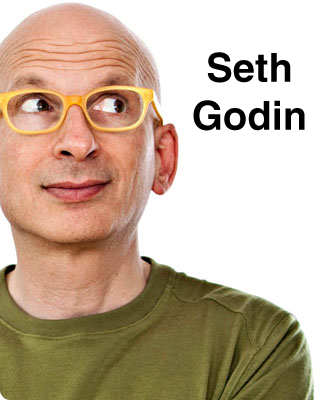 I like to read Seth Godin's blog and even when I don't, people that know me send me his stuff! So today, here's something someone sent me that Seth said, good stuff, wanted to pass it on. Of course, the manager of the mediocre hotel that's reading this, the staff member of the mediocre restaurant that just got forwarded this note--they have a great excuse. Time's are tough, money is tight, the team wasn't hired by me, nobody else cares, I'm only going to be doing this gig for a year, our customers are jerks... who cares? GOOD USE OF TECHNOLOGY TODAY! I love the way we use technology and I think we can do more, if you have an idea, let me know! Last night was a lot of fun when we did our first ever simulcast of a leaders meeting! At all 4 of our Minnesota campuses we had leaders gathered to hear teaching, vision and enjoy a great time of praise and worship all delivered in HD. I loved it that I could speak to all of the campuses live and we all got the same message without having to drive to a different campus. It really is a huge step for our church and as the technology increases, we will be able to do this for church services, special meetings, training, state of the church meetings, and more. Thank you to all of you that made your way to the meeting and said "You can count on me, I'm a leader!" It's so humbling that so many of you are giving so much of your time to advance the cause of Christ at River Valley and I know there are big things ahead as we add to our numbers and become better leaders. As you read the book, "The Circle Maker", let me know what you think of it, I love that we get to invest in you with the book and I believe you'll dream big things for God as you are challenged by Mark Batterson in his new book. For those of you that weren't at the leader's meeting, be sure to watch the teachings on-line and you can purchase the book at church this weekend. It will be available for purchase at all of our campuses or at Amazon if you prefer a digital version. It should be a great book to read as we get ready for Awake 21 with 21 days of prayer and fasting starting January 15th! WOW, HUGE LAPSE, SO SORRY! Christmas was amazing from a church perspective, my family perspective and personally! Christmas Eve services were great and it was the right call to move all services from Christmas to Christmas Eve. New Years Eve was great as we celebrated in Valencia Spain and took part in some Spanish traditions. Still not sure why we did it but we ate 12 grapes as we counted down, 12,11,10,9... And then you go around hugging everyone and kissing on the cheek.) Or "air kissing" near the cheek! Then on New Year's Day, we launched Iglesia River Valley! Now we have a church in Valencia Spain that is part of River Valley! So glad that Jeff and Wendy Steen are our campus pastors there and that we can invest in a city and country that needs something to happen! I just set my goals for 2012 and will reveal some of them to our Leaders at our Leaders trainning night this Tuesday. It will be simulcast to all of our campuses so no need to travel far for the event! (By the way, for those of you wondering, I only read 55 books last year...) If you are a leader or want to be a leader at River Valley, show up at your campus on Tuesday night at 7PM and be a part of what God's wanting to do at River Valley in 2012. It will be good, I promise! Several of you were asking about the thing I read in my sermon concerning Hope so I will post it here for you to see. Glad this can be of help to you! When we feel rejected and abandoned, hope reminds us we’re not alone…and that we’ll make it. When we say our final farewell to someone we love, hope in the life beyond gets us through the grief. Without hope, prisoners of war languish and die. Without hope, students get discouraged and drop out of school. Without hope, athletic teams slump and keep losing. Without hope, amateur authors will stop writing. Without hope, addicts return to their habits, married couples decide to divorce, inventors, artists, entertainers, and entrepreneurs lose their creativity. Without hope, even preachers, and strong Christians, struggle to press on. I haven't been sick in a long, long time and it has been a real challenge to be at home for three days and spend most of the time in bed. Trust me, I wanted to get moving, do something, be productive but every time I tried, wham, I was sick and exhausted. I didn't want to read, watch tv, or even talk or text, I was sick. It was kind of funny however because I'd have bursts of energy and there were little piles of projects all over the house that I started and abandoned! I'm so glad Becca has put up with me these past three days! One last thing, Thank God today for your health. Seriously, we are so blessed to have the good health that we have and I know that I personally took it for granted. I thank God for my good health, my high level of energy that I have every day and the ability to sleep in almost any situation! I am once again reminded how frail we are and that we need to realize that even our health, our breath, and our heart beats are all gifts from God. Thank you God for good health! It's Monday morning and I'm back from Israel, jet lagged (Got up at 4:14AM, NOT NORMAL!) and getting back into the swing of things. I have so many thoughts in my mind, so here are a few random thoughts, feel free to comment, I'm thinking out loud on some of this stuff and maybe your insights will help me process my thoughts! Israel is a must see trip. The Bible comes alive, you can feel the tension and the Spirit of God and being there is like having a semester of Bible College! I downloaded the new River Valley Christmas EP and love it! Seriously well done! I really am glad that Pastor Ryan lead the efforts to do this and all the money made from iTunes goes to Toys for Tots! It's a great way to get some new Christmas music and also help out kids in need. The worship team will be on KARE 11 soon and we'll also be presenting a check on the 10PM news, I'll keep you posted as to the dates for all of this. I'm preaching this week on Part II of Unstoppable - the topic this week, HOPE! I'll be using some of the stuff I did for Sparkle and adding new stuff but I loved that message so much that I want the men to hear it and also anyone that missed Sparkle! I can't wait to preach this weekend! We're bringing in Sam Chand tomorrow and Wednesday to do some coaching for me and our team and I'm really looking forward to this time together. Sam has been a coach to so many pastors and leaders and I really felt the need to get some extra insight as our church continues to grow and reach more people. I NEVER want to stop learning, never stop improving and always try to maximize every talent God has given me! Going to go work out now, food in Israel was amazing! Gained a few lbs.... Thanks for letting me ramble... It helped. The team has been amazing and it has meant the world to me to have my mother and my son Connor with me. The only way the team would have been better is if Becca and Logan were with us. (we left them home to celebrate Thanksgiving without us. Hopefully we have some stuffing waiting for us when we get home.) No complaints, good attitudes, willing learners and adventurous. My kind of team! One special treat was being able to run my theory by one of the leading archaeologist in Israel as to where Pentecost might have happened in the book of Acts. He didn't disagree with me and gave one other possibility. Real good stuff as we study and pray and learn and draw closer to God. I can't stress it enough, if you get an opportunity to go to Israel, do it! Looking forward to getting home in MN, hopefully it will still be warm when we get home!